Based on a special request and a good conversation with the Governor’s Council of Economic Advisors last week at our meeting, the following graph is a modified version of the Portland, Seattle and the Rest post a few weeks back. The differences are that two lines have been added: Washington excluding both Seattle and Tri-Cities, and Oregon exluding Portland, Bend, Medford and Eugene. 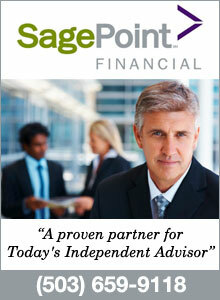 The reasons for doing so are Hanford and Housing. Tri-Cities’ strength, essentially added one percentage point to the good for the non-Seattle Washington, as seen by the differences in the green and purple lines below. The Oregon change is to try and strip out some of the housing bubble losses seen in both Bend and Medford. We know that the larger the housing boom and bust, the worst specific regions fared this business cycle. Given that Bend, Eugene, and Medford account for roughly 40% of non-Portland Oregon, their numbers will push the total category around. The end result is the differences seen by the two lower, blue colored lines, which is about 1.5 percentage points. 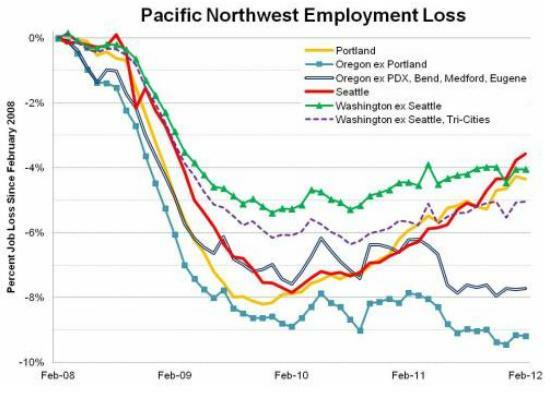 What the graph effectively shows is that the recession’s impact on non-Seattle Washington, once you account for Tri-Cities’ strength, and non-Portland Oregon, once you account for the huge housing bubble related losses in Southern and Central Oregon, are much closer than the original graph illustrated. During the conversation at the Council meeting I scribbled the following note to myself “Housing, Housing, Housing, Housing,” which is probably right when discussing the recession’s impact outside of Portland. One technical note: the employment data is not officially benchmarked (revised) for the second half of 2011, and early indications are the non-Portland areas will show better employment numbers than seen above, although any upward revision is not expected to match the strength shown in the Portland numbers. How sad for rural Oregon communities and folk. The governor and legislators should be doing much more to help rural Oregon but instead side with Portland urbanites in shutting down rural Oregon job opportunites, such as energy export terminals and state and federal forest harvesting. Urban enviromental over-activists should be ashamed of what they are doing to cause increased poverty in rural Oregon. The tourism counter argument by these elitests isn’t working, and never will. Rural folk don’t want government welfare but want to feel valuable as workers instead. Put rural Oregon back to work by taking valuable projects, moving the pendulm back towards economic prosperity from over emphasis on environment (rather more like, weekend playgrounds for the rich urbanite).